LONDON(Reuters): Britain's Conservative party has secured an effective parliamentary majority with most results from a national election reported. 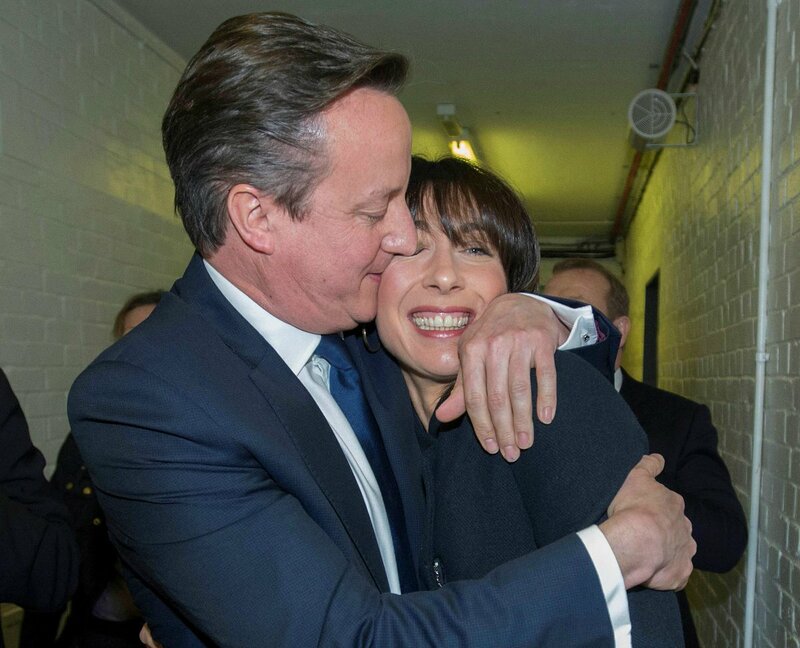 With only 10 of 650 parliamentary seats still to announce results on Friday, the Conservatives have won 325. The main opposition Labour party is trailing far behind on 228. Prime Minister David Cameron won an emphatic election victory in Britain, overturning predictions that the vote would be the closest in decades to sweep into office for another five years, with his Labour opponents in tatters. The sterling currency soared on a result that reversed expectations of an indecisive result that could have left Cameron jockeying for power with his Labour rival, Ed Miliband. Instead, Cameron was due to meet Queen Elizabeth before noon to accept a swift mandate to form a government. Andrea Jenkyns -who has just kicked out Ed Balls - hugs her delighted mum. Says Labour voters came over to her. What was said to be the most unpredictable elections for the country, UK has astonished political pundits by giving majority to the Tories. On the other hand, Scottish Nationalist Party leader Nicola Sturgeon, dubbed as most dangerous woman in Britain, took these results by storm. SNP won 56 out of 59 seats in Scotland. Thanking their voters in a tweet, SNP leader said that SNP will make their voices heard in Westminster. The United Kingdom includes England, Scotland, Northern Ireland and Wales. England makes up 85% of the population but Scottish politicians elected to parliament in London have historically held important government posts. That will now be impossible with the SNP holding nearly all Scottish seats. The results have claimed casualties of leadership. Nick Clegg of Liberal Democrats resigned from his post saying, "Clearly the results have been immeasurably more crushing and unkind than I could ever have feared. I must take responsibility, and therefore I announce that I will be resigning as leader of the Liberal Democrats. A leadership election will now take place according to the party's rules." UKIP's Nigel Farage quit the leadership after he lost South Thanet. But said he didn't rule out running for the leadership again. Here's to a brighter future for everyone. "There will be a leadership election for the next leader of UKIP in September and I will consider over the course of this summer whether to put my name forward to do that job again," Farage told reporters. Big blow to UKIP as the face of their campaign for general elections 2015, Nigel Farage lost to Conservative Craig Mackinlay. This was his sixth attempt to get into the House of Commons. As the counting for 609 seats out of 625 are either done or ongoing, latest projection by BBC is now projecting 329 seats to David Cameron's Conservative Party. In continued downfall for Labour party, another high-profile casualty was registered in the form of shadow chancellor Ed Balls. He lost his Morley and Outwood constituency to the Tory candidate Andrea Jenkyns. One happy David Cameron returns to 10 Downing Street with wife Samantha in tow. All results for seats in Scotland are out. Scottish National Party 'tsunami' took almost all of Scotland by winning 56 seats of 59 designated for them in Westminster. David Mundell of Conservatives, Ian Murray of Labour and Allistair Carmichael of LibDem managed to win one seat each for their respective parties. Results for all 18 seats of Northern Ireland are out. Democratic Unionist Party has won 8 seats followed by Sinn Fein with four seats. SDLP have three and Ulster Unionist have won two seats each. Latest updates by BBC in their exit poll projection, deduct a seat from the surging Conservatives to the final tally of 325 in Westminster. They are also predicting 232 for Labour and 56 seats for SNP. Meanwhile, Tories are enjoying exit of MP Mark Reckless from Rochester and Strood who defected to UKIP in 2010. Current PM of United Kingdom and Conservative Party leader for the general elections of 2015, David Cameron has successfully kept his constituency of Witney. Exceeding his majority from the last time by 25,155 votes, Cameron said that results are very strong for Conservative Party. He said he will implement as quickly as possible devolution for Scotland and Wales. He wants his government to reclaim the mantle of one nation. Leader of Labour Party, the main opponents to Tories, Ed Miliband has successfully held Doncaster with 20,708 votes. In his acceptance speech, Miliband admitted that it has been a 'disappointing and difficult night' for Labour Party. He said that he will go to London and wait for the full results to come through. Labour Party leaders have started to come out and are now asking Miliband to reconsider his position. Liberal Democrat leader and Deputy Prime Minister of UK, Nick Clegg has retained his seat of Sheffiled Hallam. According to The Guardian, in his acceptance speech he said that, many people did not support him this time. His message to them is that he will work for all people in the constituency. He says this has been “a crual and punishing” night for the Lib Dems. He says he will be making further remarks about the implications for his party, and his leadership, when he addresses colleagues later on Friday. In Northern Ireland, Democratic Unionist Party retained eight seats in Britain's parliament on Friday and said they would consider supporting a minority Conservative government in exchange for a package of financial and political concessions. Mayor of London and Conservative candidate for Parliament, Boris Johnson has won the seat of Uxbridge and South Ruislip. It's a double celebration for Johnson as it's his wedding anniversary too! Meanwhile in Scotland, all the results for seats in Glasgow are out. All seven seats are won by SNP. Alistair Carmichael of Liberal Democrats has managed to hold in Oekney and Shetland. This means no clean swipe for SNP. In a stunning victory for the SNP, Labour's Douglas Alexander -- the shadow foreign secretary and campaign co-ordinator -- lost to a 20-year-old politics student, Mhairi Black by nearly 6,000 votes. Early wins for the Scottish National Party (SNP) included the ousting of the Labour party leader Paisley in Scotland. Such a victory means SNP might sett the stage for a new battle over Scottish independence. Scottish National Party is headed towards landslide win in Scotland. Formerly held by ex-Prime Minister and Labour Party member Gordon Brown, Kirkcaldy & Cowdenbeath falls to SNP.